Dedicated to supporting actions defending the quality, integrity, environment and sports associated with the Lymington River. Following the recent decision of the High Court which rejected the LRA's request for a Judicial Review of the government’s refusal to set aside the results of the Wightlink Public Enquiry in October last year the LRA has issued the following statement. LRA has sought permission to appeal the decision. LRA seeks determination on the requirements of the section of the Habitats Directive that Wightlink appear to have avoided and which the members of the EMP seem to be unclear about. 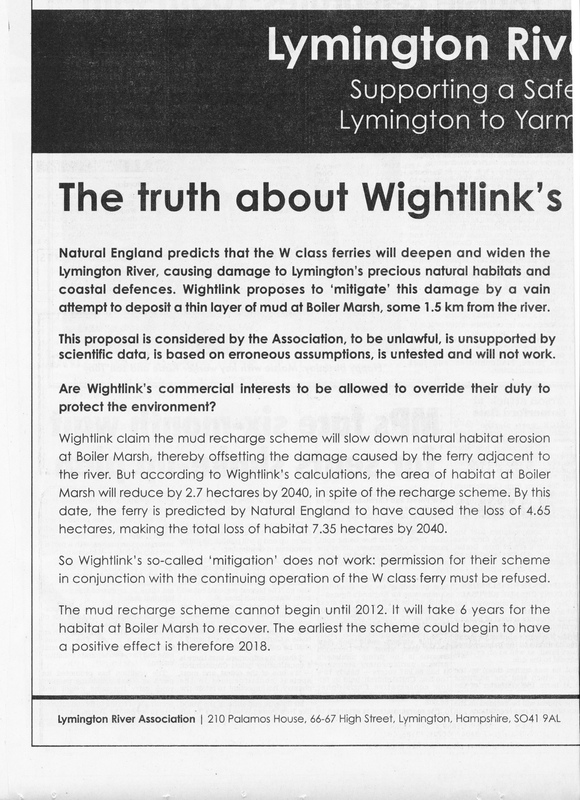 The result of this confusion is Wightlink are causing loss of habitat in the Lymington River and are allowed to do so if they put mud on a section of marsh a mile away ! This is clearly not what the Habitats Directive provides for, which is NO Negative Impact, the game of words by Wightlink that the site is one area and so long as the whole site is not losing habitat then damaging one part of it is OK. The Boiler Marsh conservation, if it were so, would be very welcome but it is a separate project, it may contribute to reducing the risk of marsh area break up but it does not create new habitat as claimed by Wightlink. 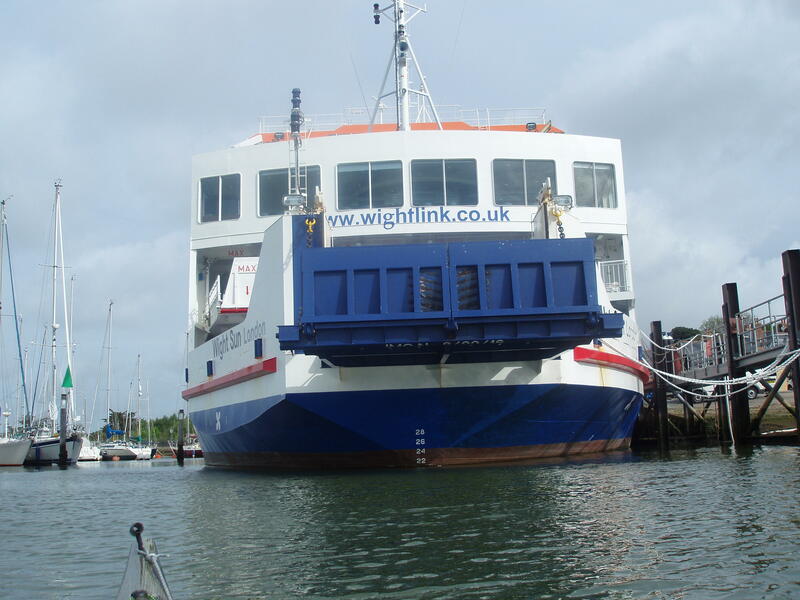 The position of the LRA has never been that it wished to stop the vital Wightlink ferry service linking Lymington and Yarmouth which is very much in the interests of both communities as well as the Isle of Wight generally. However Wightlink's cynical decision to ignore the advice of Natural England and to unlawfully introduce the much larger W class vessels in 2009 and the unwillingness of the authorities to take any effective action to require Wightlink to obey the law, meant their actions would have gone unchallenged. Far from being the vexatious litigant which Wightlink have chosen to characterise the LRA as, the High Court fully supported every aspect of the LRA's position in 2009 and found that Wightlink had “Put its commercial interests before its duty as a Harbour Authority” and had acted unlawfully in introducing the vessels without any environmental assessment and against the advice of Natural England and the Lymington Harbour Commission . The LRA's costs were paid in full which would not be the case if the High Court had viewed our actions as in any way vexatious. 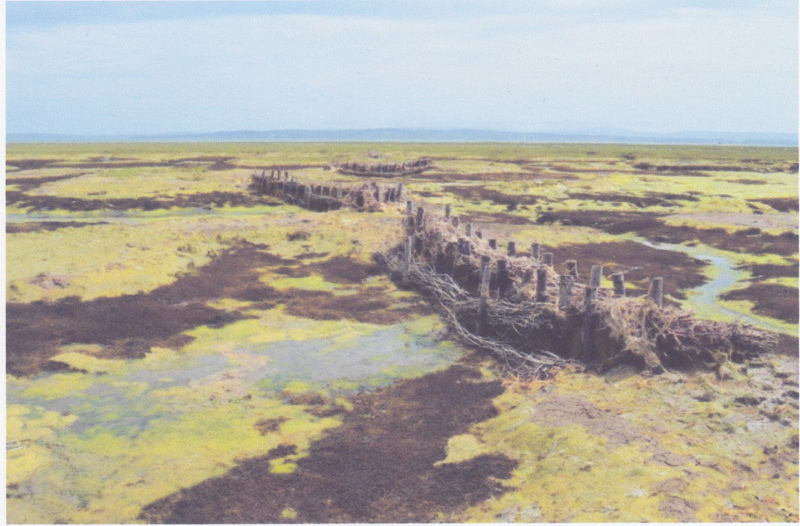 The LRA’s legal action was therefore contributory to requiring Wightlink to undertake a proper environmental impact assessment from which a mitigation programme involving habitat creation at Boiler Marsh supervised by an Environmental Monitoring Panel, was eventually agreed and given legal force following the Public Inquiry. Without the action of the LRA in undertaking legal action, no environmental mitigation for the damage caused by the vessels would have been put in place and there would be no Environmental Monitoring Panel in operation today. However welcome as the mitigation programme is in at least some action towards marsh conservation , the LRA is far from satisfied that the damage being done to the estuary was fully taken into account by the Planning Inspector in the Public Inquiry last October which is why the LRA saught leave for a Judicial Review of the Inspector's decision. At the heart of the issue which LRA were asking the High Court to set before a Judicial Review, was the nature of the Public Inquiry itself whereby the Inspector appeared to set aside European law on habitat protection in favour of economic benefits, which on planning grounds alone she felt were more important than habitat protection. Legal advice to the LRA was and remains, that a Planning Inspector is not legally allowed to set aside the legally binding habitat protection rules designed to protect the most important areas in the country. In ordering that Wightlink should on economic grounds be allowed a greater number of sailings than Natural England wished to see permitted, the Planning Inspector appears to the LRA to have taken to herself powers which European law states can only be exercised by a Government Minister and even then only after a full and proper assessment of alternative methods of avoidance of negative impact have been fully examined. Looking to the future the LRA will await advice from its lawyers on the High Court appeal. The LRA will however continued to engage with the relevant authorities and make representations to the members of the Environmental Monitoring Panel who are supervising the level of damage which the vessels are causing to the river and which they have decided has to be mitigated by habitat creation at Boiler Marsh. We continue to have reservations about the management and independence of the Environmental Monitoring Panel which is currently run by Wightlink and whose principal source of scientific analysis is provided by ABPMer, Wightlink's paid consultants. 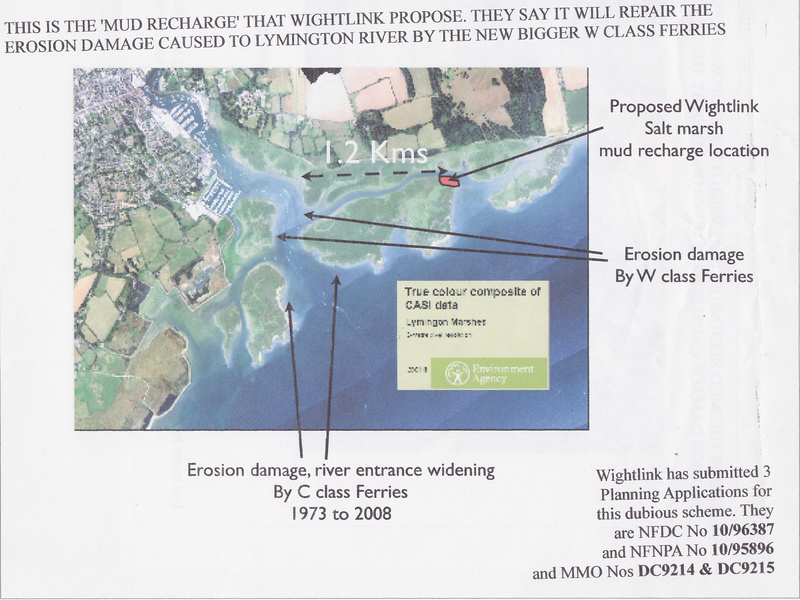 We currently have concerns about the independence of the information provided to the Environmentally Monitoring Panel by Wightlink's consultants who in their latest report to Environmental Monitoring Panel appeared to be suggesting that all previous surveys of the depth of the river were subject to such large errors that they should be ignored in future assessments of the damage caused by the W class ferries. This appears to give the green light to ignore much of the damage which the vessels have already caused and establishing a new baseline for future assessments which will further reduce the apparent impact of the vessels . The LRA have requested that independent stakeholders, such as the LRA and others are included in the membership of the Environment Monitoring Panel to ensure that an independent viewpoint can be included in its discussions but so far this request has not been acknowledged. If Wightlink are serious about engaging with a wide range of stakeholder groups we would urge them to allow the LRA to become members of the Environmental Monitoring Panel to demonstrate that the process is open and transparent. We very much hope that working in conjunction with the authorities and making representations to the Environmental Monitoring Panel, we can help bring about policies which put preservation of the marshes at the heart of the management of the river in the years ahead. We very much hope that the members of the Environmental Monitoring Panel will have necessary independence to properly monitor and assess the effects of these large vessels on the Lymington River. If, as many suspect, the W class vessels are found to be causing major deepening to the river and loss of the river banks and surrounding marshes in the years ahead, we plan to see that the Environmental Monitoring Panel will take the necessary actions to ensure that proper management is put in place . Wightlink's Mud Recharge is not working as contracted. As predicted by LRA. Click on the button below for a report by LRA specialists. The Final Word on Ferries from those on the Isle of Wight. Overall conclusion 323. I have concluded, having regard to the project as a whole, including the ferry operations, that it will not adversely affect the integrity of the Natura 2000 sites and there would be no damage to the SSSI. Having considered all other matters, I am satisfied that the appeal developments accord with the provisions of national and local planning policy and are acceptable. Accordingly for the reasons given above I conclude that the appeals should be allowed and planning permission granted. 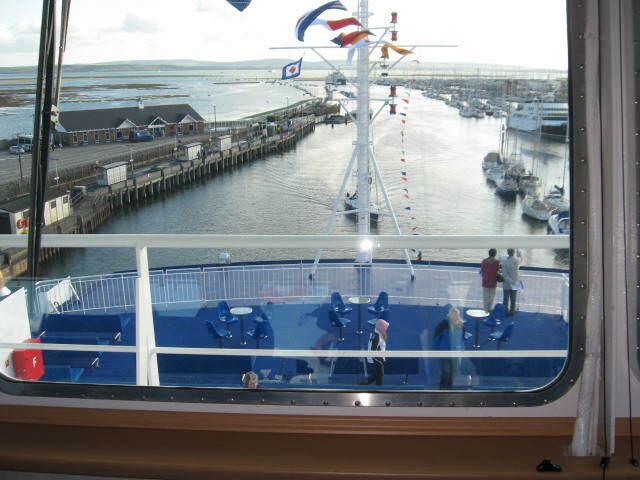 On Monday 14th March 2011 Radio Solent held a 'Commutors Confidential' broadcast from aboard a Wightlink ferry. To hear an extract click on the button below. It may take some time to load if your internet is slow. Patience may be required, but it is worth it. There have recently been emails and Tweets about the Lymington River Association which are untrue. They have alleged that the LRA wishes to close down the Lymington to Yarmouth Ferry. Nothing could be further from the truth. The LRA knows that the ferry is essential for Lymington, Yarmouth and West Wight. But the new W Class ferry is not what is required. It carries far fewer passengers than the previous C class. Why? Because it is orientated to carry lorries above all. It carries only 360 passengers against the previous 510 - while it carries 348 tonnes of vehicles when the C Class carried only 156 tonnes. Is this what is needed? The LRA believes that a smaller, faster, cheaper ferry is needed. This will carry the passenger load needed by the people and avoid the unpleasant scenes witnessed when passengers could not get to the Island for the 'Old Gaffers' because train and coach passengers were already filling all 360 places. A smaller ferry will be less environmentally damaging. It will not require the ludicrous 'mitigation' of dumping of 2,000 tonnes of dredging sludge, pumped by pipeline onto a 'site of special scientific interest' and bird sanctuary. Wightlink W Class was introduced illegally. Wightlink should produce a legal solution. If not there are plenty of operators who would like to take on this lucrative operation. 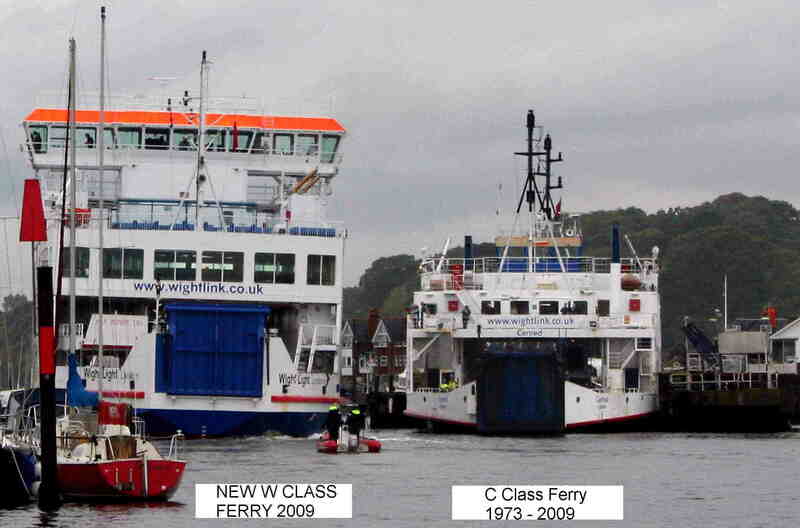 Wightlink have at last been compelled to seek planning permission for the operation of the W Class Ferries that they introduced illegally two years ago. They have applied to New Forest District Council for works to change their dock. Wightlink are also applying for what they call 'mitigation'. They want to dump 2,000 tons of mud dredged from the river onto the marshes at the far end of Pylewell Lake. This is manifestly not 'mitigation' but a means by which they hope to avoid having to take any steps at true Mitigation. This will be challenged in Court by LRA if Wightlink go ahead. There is now a third Regulator from whom Wightlink have to get Planning permission. This is the Marine Management Organisation (MMO). INDEX OF OTHER PAGES: Click to view. The Lymington River Association (LRA) warmly welcomed the High Court decision announced today which has decisively ruled in the LRA’s favour over their Judicial Review against DEFRA and Wightlink concerning the introduction of the new extremely large W Class ferries on the Lymington to Yarmouth route. The judgment by Mr Justice Owen, released this morning, declares that the Wightlink Company acted unlawfully by introducing new much larger W Class ferries onto the route and that the Board of Wightlink had put Wightlink’s commercial interests above their legal duty as a public authority to protect the environment. The Judge awarded full costs to the LRA indicating his assessment of the strength of the LRA case. Mr Justice Owen also decided that DEFRA failed to fully and properly transpose the EU Habitats Directive into domestic law in the Habitats Regulations, thereby leaving a huge gap in marine habitat protection in this country. The LRA, supported by 2400 petitioners, is seeking a ferry service that does not erode the marshes, thereby adversely affecting the habitats and coastal defences of Lymington Harbour. 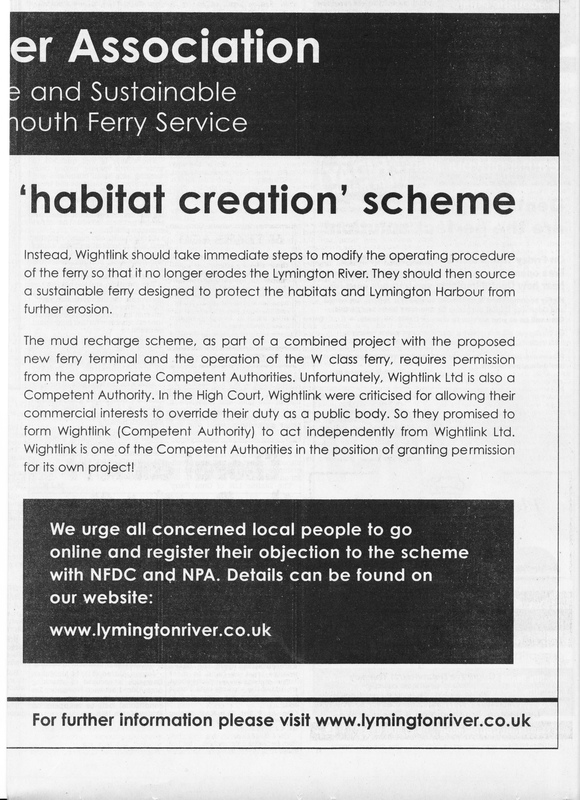 The Court’s decisions enable all stakeholders to call on Wightlink to consult, as they were required to do, and introduce a safe ferry service that works in harmony with the habitats and has regard to the amenities of the Lymington River for the people of the New Forest and the West Wight. The LRA brought the High Court action against DEFRA and Wightlink reluctantly, having tried for almost two years to persuade the regulators and Wightlink to carry out a proper scientific assessment of the likely impact of more than 22,000 annual ferry crossings with the W Class, before replacing the old vessels with these much larger ships. As this High Court judgment makes clear, the responsible government agencies had failed to put in place laws to protect marine environments - despite their obligations to do so under European law. This left government agencies powerless to intervene when Wightlink unilaterally decided, in the face of advice from Natural England and the Lymington Harbour Commission, to introduce the much larger W Class before completing proper evaluation of their likely impacts on the environment and on other river users. Mr Justice Owen acknowledges that, due to the actions of the LRA in this case, new laws have now been brought forward by DEFRA to strengthen protection for marine environments for the whole country. "It is inexcusable that we had to go to the High Court to put right a situation where the responsible government agencies had failed to put in place laws to protect the marine environment - despite their obligations to do so under European law - and which left them powerless to intervene when Wightlink unilaterally decided, in the face of advice from Natural England and the Lymington Harbour Commission, to introduce the much larger W class before completing proper evaluation of their likely impacts on the environment and on other river users. It is also unfortunate that Wightlink put their own commercial interest above protecting the important habitats nearby - which should have the highest level of protection - when they unilaterally decided to introduce these huge new ferries. We remain concerned that the authorities are still underestimating the damage these vessels are causing and we will be continuing to carry out detailed analysis of recent surveys which we feel demonstrate a large increase in damage since they came into service. We hope that Natural England will take our concerns seriously when we present our findings to them shortly and revise their current advice to the regulators. The issues for and the impact on, other river users, would seem to be substantial and will receive ever more attention from us in the weeks and months to come. A present to Lymington from Wightlink : By dead of night the new ferry 'Wight Light' crept into Lymington, causing some consternation to those who opened their curtains to find it blocking their view of the Isle-of-Wight. But they will have to get used to it - now there are three ! "Two ferries, the one on the left "marginally bigger" according to Wightlink"
"The view from the Helmsmans eye position. No view of the area in front of the ship"
"If you cannot see the ferry’s bridge, they will not be able to see you"
Who hit all the Piles? 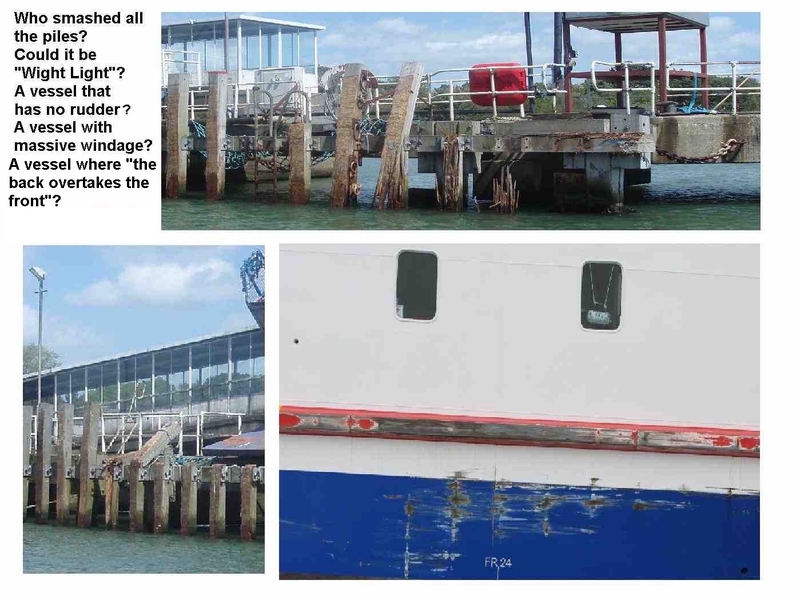 "Damage on the Lymington ferry berth and matching scars on 'Wight Light'"